Diesel multiple unit (DMU) is an increasingly attractive technology for providing passenger service on short and medium distance, non-electrified railroad lines. A DMU is a railroad passenger vehicle that is powered by a built-in diesel engine. The output of this engine is transferred to the wheels via a mechanical, hydraulic or electrical coupling. DMUs can be operated singularly, or with any number of units coupled together and controlled by a single operator. DMUs feature a much lower cost of operation than trains of comparable capacity hauled by diesel locomotives as well as the ability to operate similar to conventional light rail vehicles but without requiring electrification. This has made them attractive for use on branch lines with relatively light passenger traffic and for temporary use on lines with greater traffic potential but which are not yet electrified. In addition to their great flexibility to operate in any length, DMUs also feature substantially lower fuel consumption and noise output than locomotive hauled trains as well as faster acceleration. Moreover, it is much easier to reverse operation at the end of a line, because there is typically an operator's compartment in each end of each car, and thus all that is necessary is for the operator to walk to the other end of the car or train and begin driving from that end. The biggest advantage of DMUs as compared with electrically operated light rail vehicles is that they can provide a roughly comparable service without the need for electrification. Electrification, including the erection of overhead wires and the building of substations for power conversion, is costly and is usually only economical for lines that have a relatively high frequency of service. Thus, DMUs are usually a better choice for lines with relatively light traffic and lines with heavier traffic that have not yet been electrified. Disadvantages of DMUs as compared with electrically powered light rail vehicles include higher energy costs per passenger for large traffic volumes, dependence on fossil fuels, the inconvenience of having to maintain fueling facilities and refuel the vehicles, increased air pollution, greater audible noise output, slower acceleration and higher maintenance costs. DMUs and other self-propelled rail passenger vehicles have been in use in various countries for decades, and they are still employed extensively in Japan, the UK and elsewhere. The most popular and long lived DMUs in North America are the RDCs (rail diesel cars), which were built by the Budd Company from 1949 through 1956. Some of these are still in operation. 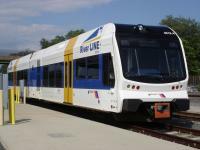 The past several decades have seen a resurgence of interest in local rail passenger transport1 as a result of growing automobile traffic congestion, rising air pollution, higher fuel prices and increased concern about climate change2. Most of this interest has been focused on electrically powered light rail. However, it has been accompanied by a renewed rise of interest in DMUs for use on routes that are not yet electrified and routes with a potential traffic demand that is insufficient to justify electrification. In addition to the factors that have been resulting in the resurgence of light rail, the revival of interest in DMUs is also a result of technological advances which have given them increased energy efficiency, reduced emissions (including fine particles), smoother rides, enhanced safety, low floors (for easier entry and exit), lower noise output, simplified maintenance, increased passenger capacity and faster acceleration. Some models also feature sufficient reserve strength to be able to haul several non-powered rail vehicles and the ability to use biodiesel fuels. 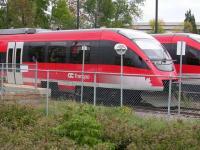 DMUs on the O-Train in Ottawa, Canada. Among the other urban areas in North America that are considering using DMUs on existing, non-electrified rail lines are Boston, Chicago, Los Angeles, North Carolina and South Florida. It has also been proposed to use DMUs on the Eastside railroad, which runs through Seattle's eastern suburbs. DMUs are manufactured by companies in several countries including Canada, India, Japan, South Korea, Switzerland and the U.S.
1This surge is clearly evident from a casual glance at the page Rail Transit Systems in the U.S., which lists systems in operation and the dates that they started revenue service as well as systems currently under construction. 2For a look at how rail transit can be an effective weapon in combatting global warming, see How Rail Transit on the Eastside Can Help Fight Climate Change, Eastside Rail Now, March 2007. 3For more information about the O-Train, see Ottawa's Pioneering O-Train, Eastside Rail Now, March 2007. 4The River Line's home page is www.riverline.com. 5The Sprinter's home page is www.gonctd.com/oerail/oerail.html. This page created January 22, 2007. Last updated March 24, 2007.